Friends of Santa Cruz State Parks (Friends) will host Libro Castro, a book launch and fundraising party at Castro Adobe State Historic Park, to celebrate the new and updated version of The Castro Adobe in the Twentieth Century from Earthquake to Earthquake, originally written by former Castro Adobe resident Suzanne Paizis. Proceeds from the event support the full opening of Castro Adobe State Historic Park in the Pajaro Valley. The special event will be 4-7 p.m. Saturday, June 23, at Castro Adobe State Historic Park, 184 Old Adobe Road, Watsonville. Tickets are $75 with food and drinks, or $100 including a copy of the book at a discounted price, as well as food and drinks. Advanced ticket purchase is required. Tickets are available at www.thatsmypark.org or by calling 831-429-1840. Additional donations are gratefully accepted and support the park. All donations and ticket sales will be matched 1:1 toward the opening of the park, up to $270,000 by the James & Carol Toney Fund. Writer, historian and one-time Castro Adobe owner Suzanne Paizis traced the history of the Castro Adobe and the many families who called it home from 1906 to 1989, compiling her research in The Castro Adobe in the Twentieth Century from Earthquake to Earthquake, the unrivaled chronicle of property and its inhabitants. Working with well-respected writer Traci Hukill, Friends of Santa Cruz State Parks commissioned an update to the original book. The new edition picks up in 2002, when the State of California acquired the Castro Adobe, beginning a long process to transform a crumbling relic from the Mexican Rancho period into Castro Adobe State Historic Park. Libro Castro is the fifth annual Stewardship Event at Castro Adobe State Historic Park, honoring those who had a role in preserving this special piece of Pajaro Valley history. Attendees are encouraged to arrive in early 1960s period dress. To minimize impacts to the sensitive grounds of the Castro Adobe, guests are asked to park offsite at Strawberry Business Center, 125 Hangar Way, Watsonville. Free shuttles will run throughout the evening. Limited parking for mobility-impaired guests is available near the entrance to the event. 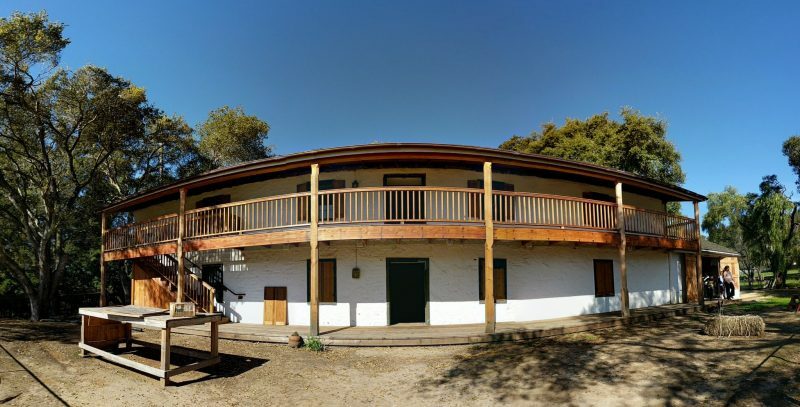 Friends is leading a multi-year restoration effort to preserve and interpret the Castro Adobe as the region’s next State Historic Park and the first State Historic Park in the Pajaro Valley. All proceeds from Libro Castro will be dedicated to this effort. The Paizis family, Castro Adobe stewards (1959-63), owned and lived in the Castro Adobe with their young family, including Terry, Varvara and Melanie. During their years at the adobe, John was a psychologist for the Santa Cruz County Office of Education and Suzanne was a special education teacher. They had previously lived in an adobe in Carmel Valley and enthusiastically pursued structural improvements. John collected artifacts from the ground and displayed them, Terry built kitchen cabinets for the house and Varvara climbed the trees, ate their fruit and enjoyed the birds that nested outside. Baby Melanie was born near the end of the family’s time at the adobe. Later, Suzanne was a founding member of the Cabrillo Music Festival (along with friends Victor and Sydney Jowers, 2017 Stewardship Event honorees) serving as president from 1963-65. She helped organize the local chapter of the National Organization for Women (NOW) in 1971 and, in 1972, ran for the State Senate. Had she won, Suzanne would have been the first female State Senator in California. Although unsuccessful, she inspired other women to run for office and, in 1977, authored Getting Her Elected: A Political Woman’s Handbook. Suzanne’s love of the Castro is evident in her 2002 book The Joaquin Castro Adobe in the 20th Century from Earthquake to Earthquake. Located in Larkin Valley, near Watsonville, the two-story Castro Adobe, built between 1848-49, is one of the finest examples of a rancho hacienda in the Monterey Bay area. The property includes the restored cocina (kitchen) and the Potter-Church Garden, a unique outdoor space originally created by then-owners Elizabeth and David Potter (1968-72) in consultation with noted landscape architect Thomas Church. Friends is leading a multi-year restoration effort to preserve and interpret the new State Historic Park in partnership with California State Parks. Work is currently being done to finalize the preservation of the historic adobe and establish a visitor center. It is Santa Cruz County’s second state historic park and the first non-beach state park in the Pajaro Valley. To follow progress on the restoration effort, visit www.thatsmypark.org/castro-blog. The Castro Adobe, located at 184 Old Adobe Road, is open on a limited basis for special events, such as Open House Days (www.thatsmypark.org/events/castro-events). Admission is free; donations are gratefully accepted. Next Next post: Local Law Enforcement to run Flame of Hope through Northern California, kicking off Special Olympics summer games.